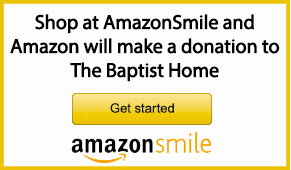 Thank you for your interest in supporting the ministry of The Baptist Home! This ministry has been underwritten, from the beginning, by gifts from friends like you. Timely contributions have literally saved the ministry multiple times in its history. Because of you, nearly 50% of The Home’s residents receive some benevolent assistance. All gifts to The Baptist Home and The Baptist Home Foundation (Planned Giving) support the ongoing ministry of The Baptist Home. Future Capital campaign projects at The Baptist Home. It has been a long held tradition for Missouri Baptists to recognize their anniversaries by giving to The Baptist Home. Help provide the ministry of love by continuing this tradition of giving because of love. Visit our Planned Giving section to learn more about Life Income Arrangements, Gift Annuities and Estate Planning as well as utilize various online resources such as the Online Wills Planner, Planned Gifts Calculator, Email Newsletter sign-up and much more. The Baptist Home is sharing its ministries to people in Belarus, Ukraine, Moldova, Norway, China, Guatemala and El Salvador. For more information about specific projects visit the Global section of the website.